The Joyride Filbert was a big soft noodle. Joyride was a brand that was actually started by Matt Cummins and Kris Jamioson when they thought GNU was dead and they needed to find a new board sponsor. So they made up Joyride. But once they found out that Mervin was going to launch Lib Tech they ditched the whole Joyride gig and gave the idea to some people in Oregon that were able to fund the company. 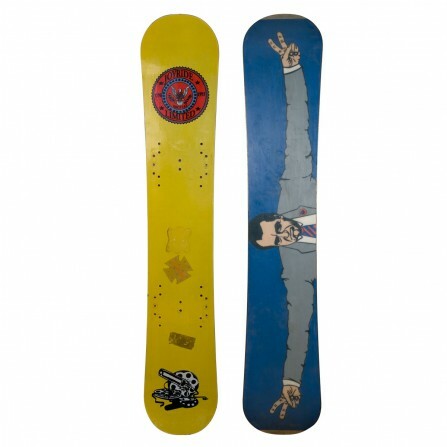 The Filbert was a long, soft, quick kick nose and tail snowboard. At this point some of Joyride’s boards were being made at Thermal, like the Fuego capped board. But most of the boards were still being made by Tyler Dykman with the exception of the Joyride Eldo which was pressed at Morrow. Smokin snowboard for 2018 released a board with a similar base graphic with our 45th pres on it.